Designed for 1987-95 305/350ci (5.0/5.7L) Chevy Throttle Body Injectioned (T.B.I.) engines. Ideal for trucks, Blazers and Suburbans (Will not fit Caprice or Buick and Cadillac "B" Bodies). For 305 and 350 V8s with OEM T.B.I. 1987-95. T.B.I. water jacket similar to stock. Accepts all OEM equipment and small-bore (1-11/16'') throttle body injectors only. No chip changes or computer mods required unless entire 5.7L Power Package (manifold, cam, heads) is used. Computer chip is supplied free of charge with proof of purchase of manifold, cam and heads. The chip re-programs your computer for optimum power gains when the entire package is installed. This Total Power Package greatly improves performance. Pad Height: 4.40" Click here to determine throttle body pad height. I have a stock (just headers and higher flowing exhaust) 92 Chevy K2500 with a 5.7L engine. I'd like to upgrade to get more torque and a bit more HP. I saw in the package including the link to FiTech GoStreet EFI Throttle Body. What do you recommend? An upgrade to the Fitech EFI system with a new intake manifold will give you nice increase in power. Yes, this head will bolt to Vortec heads. What is the reason this will not work on a Cadillac. I have a 91 brougham with the 5.7 and I would like to beef it up. The electronic sensors and the throttle body are different from what we can tell. No details on this are available. Yes, you can connect the Holley throttle body to this intake. This kit does not have roller lifters in it. These are flat tappet hydraulic lifters. Stock heads are compatible with this kit. 95 5.7 silverado ext.cab. all original no oil consumption. Good shape. Runs good. Considering 3704PK and 3700 timing chain set. What is the recommended timing set point 4deg adv,4deg ret. or stock. Also which heads do you recommend. 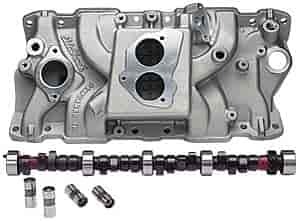 These are the recommended cylinder heads - http://www.jegs.com/i/Edelbrock/350/60859/10002/-1 Normally would recommend stock, but Edelbrock will list their thought in the instructions.